In the 1920 census of Wilson, Wilson County: at 506 [sic] Lodge Street, cafe proprietor Jessie Strickland, 28, and wife Viola, 27, and roomers Mack Strickland, 18, transfer truck driver, and James Johnson, 20, guano company laborer. 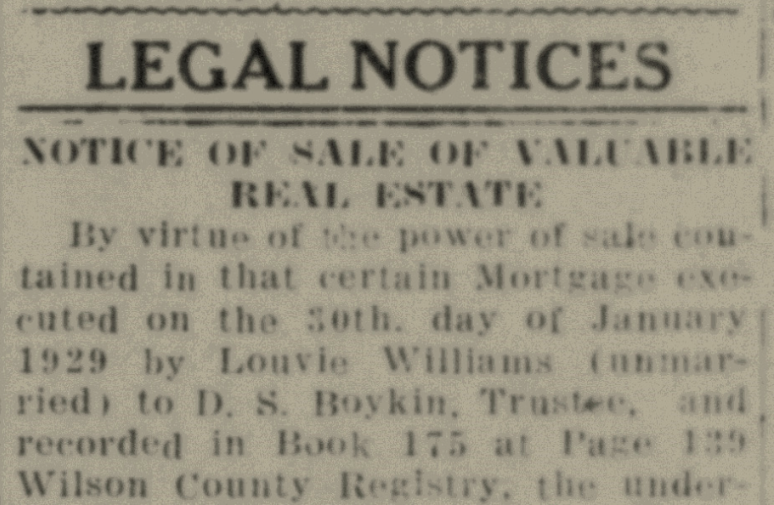 In the 1930 census of Wilson, Wilson County: at 504 Lodge Street, owned and valued at $4000, Jesse Strickland, 46, and wife Viola, 37. Their occupations are listed as farm laborer and “manufacturing [illegible]/own plant.” However, it appears that entries are off by a line, and should read “manufacturing [illegible]/own plant” and cook for private family. 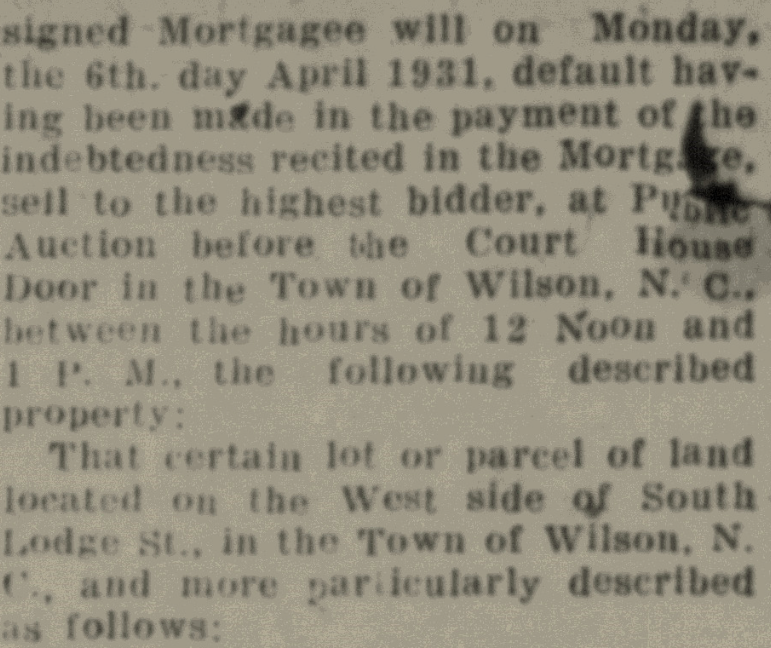 In a familiar tale of woe, the Stricklands defaulted on their mortgage, and Wilson Home & Loan Association advertised the property for auction. Wilson Daily Times, 10 November 1930. Jessie Strickland died 18 March 1932 in Wilson. Per his death certificate, he was 40 years old; was born in Wilson to Mose Farmer and Hannah Strickland; was a clerk in a store; and lived at Spring Street. Informant was Viola Strickland, 504 South Lodge. 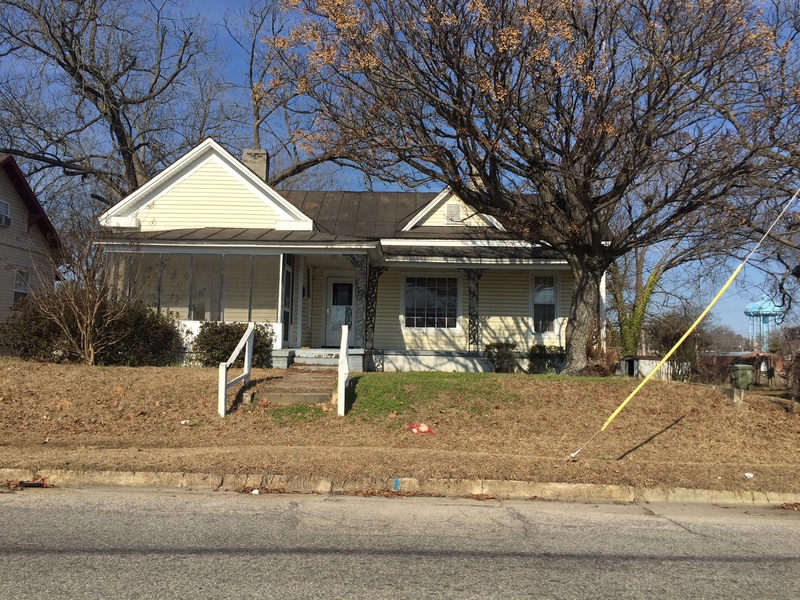 This duplex is not within the bounds of East Wilson Historic District. However, South Lodge Street — below the warehouse district — has been an African-American residential area since the turn of the twentieth century. 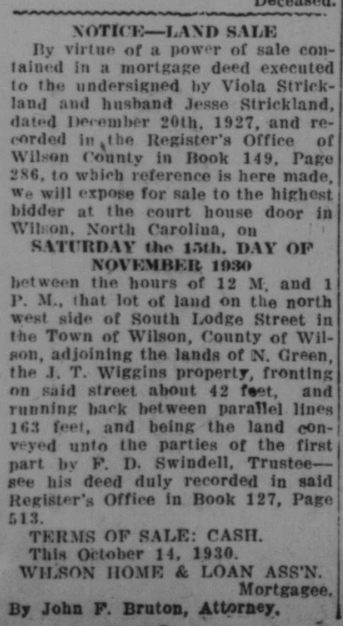 In the 1930 Hill’s Wilson, N.C., city directory: at 612 South Lodge, rented for $20/month, street sweeper Bynum Case, 38, and wife Beatrice, 35, laundress. 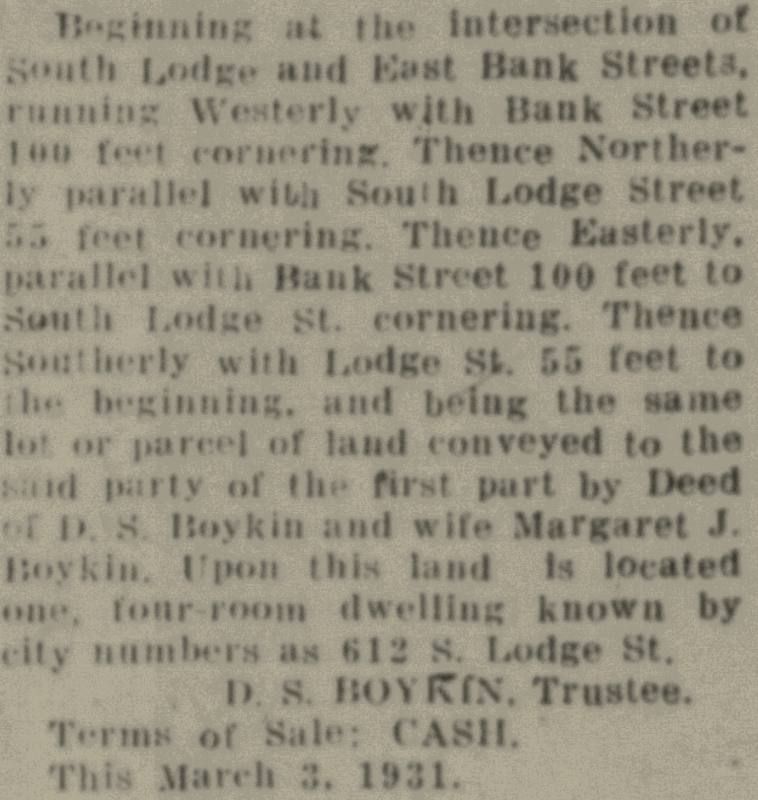 Wilson Daily Times, 4 March 1931. In the 1940 census of Wilson, Wilson County: at 612 Lodge, two families renting at $8/month each, lumber mill laborer James Simpson, 33, wife Frances, 32, and son James Lewis, 11, and building construction laborer Henry Romey McQuen, 39, wife Pearlina, 31, and daughter Lee Winstead McQuen, 10. The McQueens were born in South Carolina. Eighteen years later, the address was home to Joseph Hall, who died 3 May 1965. 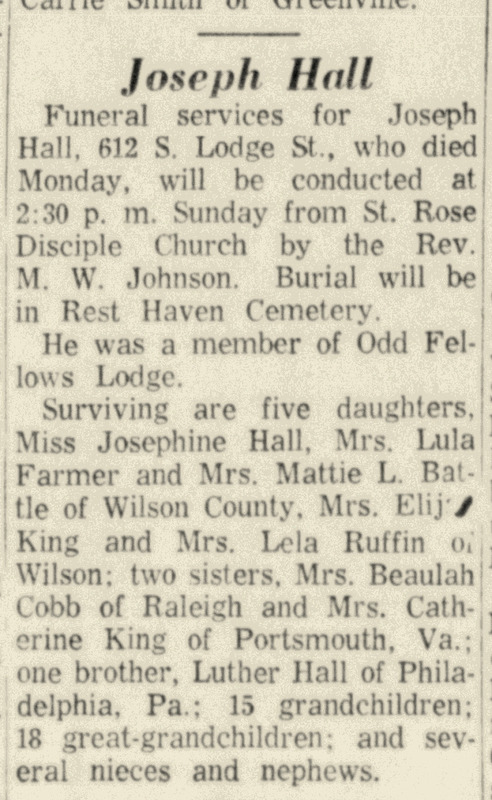 Wilson Daily Times, 7 May 1965.